50% discount for magnums of Provence rosé wines from 12 Noon to 7 pm. Served on the beach overlooking the bay for lunch, afternoon and evening at outdoor tables or sun beds. It’s not often we get to reintroduce our flagship wine. Since 1972, we have produced Fumé Blanc. As the first winery in Sonoma County to do so under this moniker, we were also the first winery to plant Sauvignon Blanc grapes in the Dry Creek Valley. For almost 40 years, we have touted the virtues of our delicious, unoaked Fumé Blanc. Dave Stare even founded the Society of Blancs (SOB’s) to help promote and educate new world wine drinkers on the incredible versatility of the Sauvignon Blanc variety. With the release of the 2010 vintage, we are proud to introduce a new package for Fumé Blanc. Perhaps most intaining our iconic sailing imagery while also incorporating some modern touches and sense will notice a QR code which scans to a two-minute video of Dave, Don and Kim discussing the new vintage. 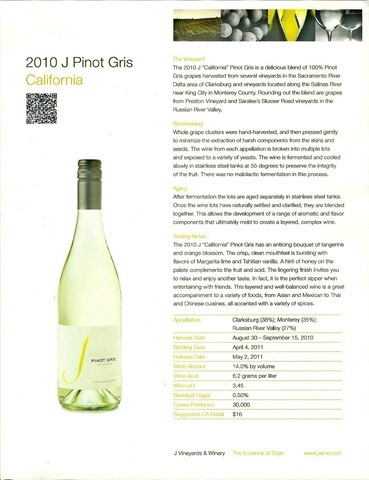 The QR code is a terrific technological advancement, which transports consumers to the vineyard and winery to hear directly from the family about the wine. Just what California can (and should) do with this grape. Sprightly, delicious, with a lovely balance, just enough acid, it’s fresh as a daisy. Perfect for an elegant summer dinner. Terrific with shellfish, cold chicken, veal, goat cheese and almonds. This new vintage harkens back to the early days of Fumé Blanc at Dry Creek Vineyard. At first swirl, pungent grassy aromas framed by kaffir limes leap from the glass. On the palate, the wine displays racy citrus characters along with granny smith apples, Meyer lemon and orange zest. The grassy elements repeat on the finish with acidity that is both refreshing and brisk. Dave Stare pioneered this style back in 1972 and this wine certainly carries forward all of those old school elements. Simply delicious! Once a glamorous speakeasy, today ’21’ is one of the most celebrated restaurants in New York City. In addition to its fabled Bar Room, this four-story townhouse features ten private dining rooms, including the legendary Prohibition-era Wine Cellar (which can be reserved for private parties). The world’s most glamorous saloon, is better than ever since Orient Express Hotels took it over and restored it to its past glory. The clientele is a mix of celebrities, tycoons, regulars and an attractive new young set. The aforementioned "Bar Room," with its red-checkered-cloth-to-cloth tables, and whimsical toys on the ceiling is blessed with a warm greeting by ‘21’s Restaurant Manager, Michael Shef, and some of the most professional service and best food in town. While prices are not inexpensive (although no more than many less impressive restaurants around town), a $40 pre-fixe dinner ($30 pre-fixe lunch) is a bargain. An expanded wine list offers oodles of terrific selections for $60 and under. If you go a la carte, favored appetizers include a sparkling Chilled Seafood with shrimp, oysters, clams, crab and an assortment of excellent sauces (or go for a selection of divinely fresh oysters). Other choices include a chunky Ahi Tuna Tartare, marinated Japanese cucumbers, seaweed, taro root chips, Meyer lemon purée or a fantastic Seared Foie Gras on toasted brioche, with peppercress, rhubarb compote and strawberry-papaya sauce that may be the best I’ve ever tasted. All entrees are excellent.and carefully executed. The chef has a way with seafood, so whether you select a classic Dover Sole*, grilled or sautéed to perfection, with perfect white and green asparagus and an elegant Champagne sauce, Potato-Crusted Chatham Cod with smoked bacon, corn, ramps, sautéed king oyster mushrooms in a brown butter-lemon sauce or the magnificent Sautéed Soft Shell Crabs, cooked parchment crisp and moist within, you will be delighted. For meat lovers the 21’ Burger* on a toasted Parker house bun, with frisée, preserved tomatoes, sautéed onions, haricots verts and a choice of potato; Mixed Grill of Game, wild boar chop, Mangalitsa sausage, bacon-wrapped rabbit, braised Tuscan kale, white turnips, in a grain mustard and Cognac reduction or the renown Speakeasy” Steak Tartare* with mixed greens,Champagne vinaigrette and rye toast are all superb. Desserts, by Pastry Chef Kimberly Bugler, are lush and improve with each visit. I loved the Chocolate Blackberry Vacherin with apricot coulis, a decadent Peaches & Cream Sundae with sour cream ice cream, sautéed peaches and lemon crispies, all Housemade Ice Creams, Apple Crumb Pie with walnut streusel topping and the best Cookies and Candy imaginable. Any of the helpful sommeliers, (Philip W. Pratt has been aboard for years), can find you a glass of terrific Champagne or wine that will accommodate any budget.Two Champagnes we suggest, if available:1/2 bottle of the lively Laurent-Perrier “Brut” N.V. $42, or a surprisingly affordable Champagne Aubry Brut Rose Jouy-les-Reims Premier Cru: This grower-Champagne from brothers Pierre and Philippe Aubry is a clear peach color, with a frothy mousse that falls back fairly fast, leaving a persistent bubble stream. 60% Chardonnay, 25% Pinot Noir and 15% Assemblage Pinot Meunier. A fabulous find! The rest of the encyclopedic list is a joy and other discoveries abound. The reception at “21” by Mark "Shaker" Naini (another fixture), is warm and welcoming and “21” remains one of America’s great restaurants that truly RATES its reputation as well as an A Major on the Walman Report. Copyright 2011 By Punch In International. All Rights Reserved. Nestled in the majestic Mayacamas Mountain range nearly 1,000 feet above the Sonoma Valley, is a vineyard that has been producing award‐winning Cabernet Sauvignon for three generations. Owned by the Louis M. Martini winery since 1938, the Monte Rosso vineyard (named “Monte Rosso” or “Red Mountain” for its rich, red volcanic soils) is a steep and rugged mountain vineyard with a desirable western exposure that produces wines with a unique sense of terroir. The Monte Rosso Cabernet Sauvignon is a hand crafted wine sourced from the best vineyard blocks within Monte Rosso. This is a full‐bodied wine revealing a dark ruby/purple color, and showcasing an opulent nose of dark berries, licorice, black currants, cherries and tobacco. Flavors of ripe plum with undertones of earthiness and spice, and dried fruit evolve into a rich, long, lingering finish that is impressively structured. It is a perfect complement to warm, earthy dishes, game and red meat such as wild boar, venison and grilled filet mignon. The 2006 growing season in Sonoma began with a very wet winter that lasted through bloom, followed by mild weather up to mid‐July. The second part of July saw very warm weather, but the cooling coastal fog rolled back into the area and brought relief. The ripening period of August through September was ideal, with moderate temperatures and plenty of sun to gently ripen the fruit. Harvest began in mid‐September and was completed by mid‐October. Overall, the 2006 vintage was one of the best in many years, with sound, ripe fruit of excellent quality. Harvest took place during the early morning hours in order to keep the fruit as cool as possible. The grapes were sorted and destemmed, but not crushed, leaving more than 90% whole berries in the fermentor. For maximum extraction of color and flavor, the must was in contact with the skins for an optimal 21 days; thus contributing to greater extraction of black, dark, violet hues that visually hint at the depth and flavor of the wine. After primary fermentation was complete, the wine underwent malolactic fermentation in barrels. The wine was racked as needed, and aged in French and American oak barrels. 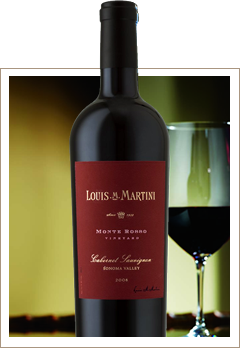 This 2006 Sonoma Valley Monte Rosso Cabernet Sauvignon was hand crafted from the best vineyard blocks at Monte Rosso. It opens with an opulent nose of dark berries, licorice, black currants, cherries and tobacco. Flavors of ripe plum, dried fruit, earthiness and spice evolve into a rich, long, lingering finish with an impressive structure. An AMAZING wine that equals, in quality, some of the great Bordeaux. Complex, somewhat closed, needing more time to develop, the balance is graceful and abundant fruit is gentle. Holding a few years will be rewarded with an amazing California experience. A delightful example of what California can do with this versatile grape. Here, the style is light and sprightly, with hints of spice, melon and citrus. At a suggested retail price of $16, we were delighted to sip it on a warm summer day. It is also perfect wit Asian cuisine, robust seafood, cold chicken, sausage and goat cheese. Look for it! Speaking directly to consumers through Social Media communication platforms is a priority for businesses all across the country, and Sonoma County’s wineries are no exception. When it comes to mobile communication, there’s an app for just about everything. Whether you tweet, blog, or watch videos, “going mobile” is clearly winning the hearts and minds of wine lovers everywhere.